Fixed bridgework, which is a set of lifelike dental crowns that serve as permanent replacements for your missing teeth. This is ideal for those who have not yet experienced the loss of jawbone density and volume that is inevitable with tooth loss. Learn more about implant-supported fixed bridgework. Fixed dentures, which, like bridgework, are never taken out of the mouth but contain not only replacement teeth but also replacement gum tissue. This works well for those who have experienced loss of gum tissue height and bone and want to prevent further deterioration while restoring a youthful facial appearance. 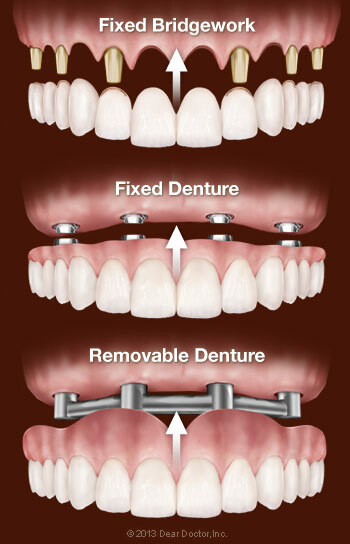 Learn more about implant-supported fixed dentures. Removable dentures, which hook onto two or more dental implants so they won't slip while you're wearing them and also offer protection against deterioration of the jawbone. 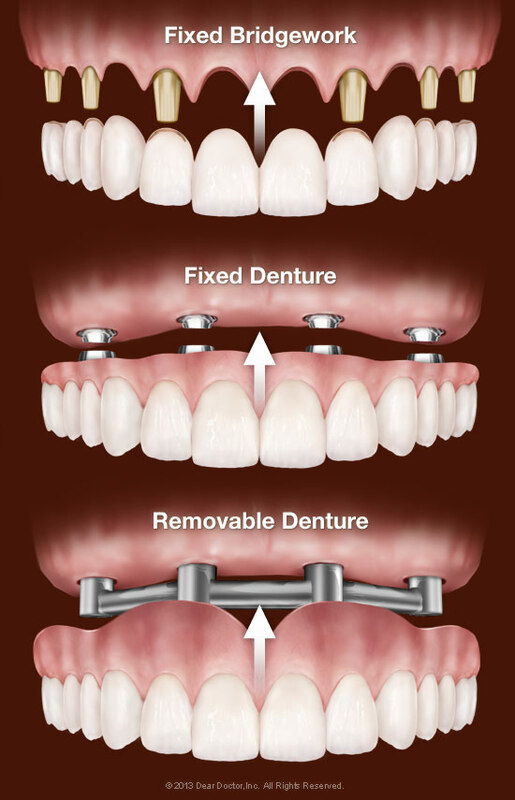 Learn more about implant-supported removable dentures. Dental implants serve the same purpose as the roots of natural teeth: They anchor the replacement teeth to your jawbone. Just like natural tooth roots, they lie under the gum line and therefore are not visible in the mouth. Only the lifelike prosthetic teeth or removable denture attached to them can be seen by you or anyone else. Because dental implants are made of titanium, a metal that has the unique ability to fuse to living bone, they are extremely stable and reliable (Learn More). 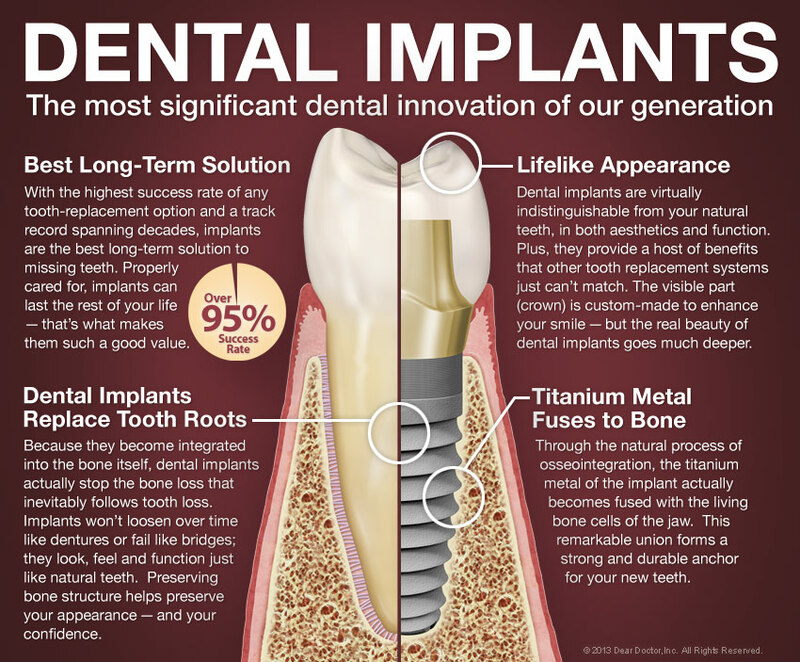 So do you need one implant for every tooth you are replacing? Definitely not. Replacing an arch of teeth with dental implants is somewhat like building a roadway bridge. You wouldn't need to put a support under every foot of road; you'd only need enough to ensure the bridge can hold up under normal stresses. Likewise, your implant teeth will be subjected to the stresses of biting and chewing, and need to be planned accordingly. Each individual has unique conditions; depending on the volume and density of the bone in your jaw, you will need as few as four and as many as six for your implant teeth to function as well as a set of healthy, natural teeth. A removable lower denture can be supported with as few as two implants; an upper removable denture will ideally need four to achieve stability. The surgery to place dental implants is a simple, routine procedure carried out in the dental office under local anesthesia in most cases. If you need to have failing teeth removed, that will be done first. After numbing the area, the appropriate number of implants will be placed in your jaw at precisely planned angles and positions to maximize support and avoid anatomical structures such as nerves and sinuses. Depending on how many implants you will need, the surgery can take anywhere from one to three hours. Most people who have dental implants placed find that any post-operative discomfort can be managed with over-the-counter anti-inflammatory medication such as ibuprofen or acetaminophen. Some don't even need to take that. What happens immediately after surgery will depend on what's best to promote healing in your case. Sometimes a set of temporary teeth can be attached immediately, so that you can leave the office with new teeth; a few months later, your permanent replacement teeth with be installed. In other cases, the implants will be left to heal for several months before any teeth are attached. Sometimes that is the best way to insure that the implants remain undisturbed as they go through the process of fusing to your jawbone, which is known as osseointegration. In either case, you will need to go easy on your newly placed implants during the crucial healing phase following surgery. We will instruct you to eat a softer diet and avoid hard, chewy foods until the process of osseointegration is complete — about two to three months. While this may seem like a long time, keep in mind that people who wear removable dentures without implants often avoid these foods permanently. The good news is that once your implants have fused to your jawbone and your new teeth are attached, you will be able to eat anything you want. In fact, you are likely to forget you even have dental implants!